The Custom Fields module appears on both the Add New Post and Add New Page pages on the Dashboard, below the Post text box. The Custom Fields module has two different text boxes: Name and Value. Simply fill out the Name and Value text boxes and then click the Add Custom Field button to add the data to your post or page. Name: Also known as the Key, you give this name to the Custom Field you’re planning to use. The name needs to be unique: It’s used in the template tag. The figure shows a Custom Field with the name mood. Value: Assigned to the Custom Field name and displayed in your blog post on your site if you use the template tag. The value assigned to the mood (the Custom Field name) is Happy. Add a template tag to your WordPress them to display a Custom Field. You can add multiple Custom Fields to one post. To do so, simply add the name and the value of the Custom Field in the appropriate text boxes on the Add New Post page; then click the Add Custom Field button to assign the data to your post. Do this for each Custom Field you want to add to your post. After you add a particular Custom Field, you can always add it to future posts. So, you can make a post tomorrow and use the mood Custom Field but assign a different value to it. If tomorrow you assign the value Sad, your post displays My Current Mood is: Sad. You can easily use just that one Custom Field on subsequent posts. You can access your Custom Fields from the drop-down list below the Name field. 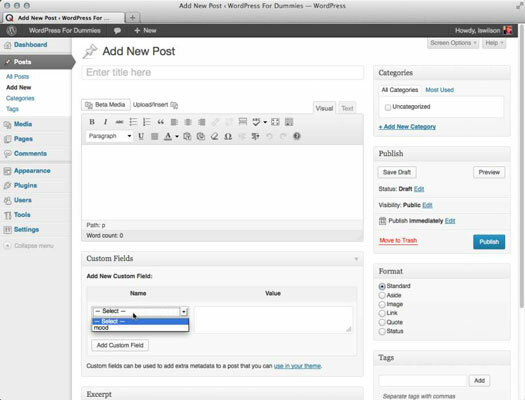 You can easily select it again and assign a new value to it in the future, because WordPress saves that Custom Field Key, assuming you may want to use it again sometime in the future. 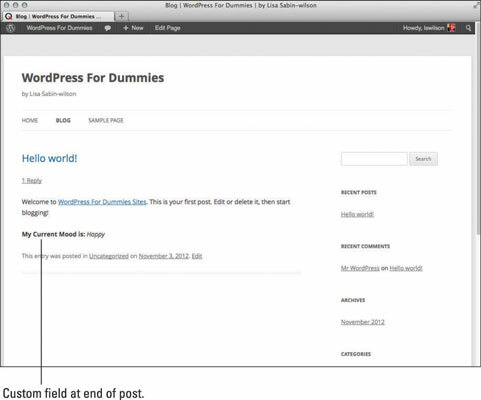 Custom Fields are considered extra data, separate from the post content itself, for your blog posts. 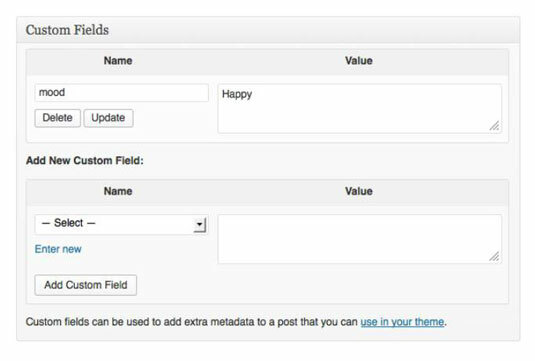 WordPress refers to Custom Fields as metadata. The Custom Field name and value get stored in the database in the wp_postmeta table, which keeps track of which names and values are assigned to each post. You can find a Custom Fields module on the Add New Page page on the Dashboard, as well, so you can add Custom Fields to either your posts or pages as needed.